- Export your project (including samples) to MASCHINE STUDIO, MASCHINE, and MASCHINE MIKRO. 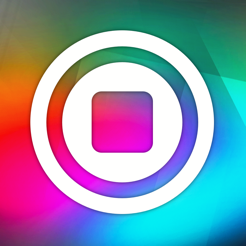 Projects exported to MASCHINE support multiple Scenes as well as Pad and Group colors. 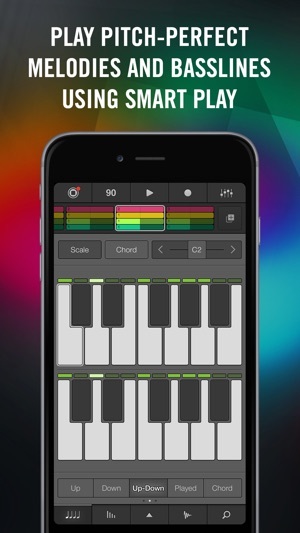 Reverb is supported by iPhone 5S, iPad Air, iPad Mini 2, or iPod 6 or newer. Thanks for using iMASCHINE 2 and leaving us your valuable feedback. For version 2.2.0 we are pleased to announce the addition of reverb to iMASCHINE 2. Exporting projects including reverb to the desktop version of MASCHINE requires MASCHINE version 2.5.0 or newer. This app is good for what it was intended to do: get done rough ideas for songs and tracks using quality (44.1 kHz and 16-bit? SERIOUSLY?!!?) sounds/samples. 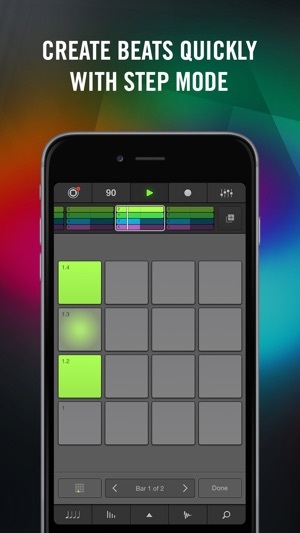 But two years or so and countless soundpacks later, I’m looking for a swing function that DOESN’T affect all 4 tracks, MIDI support for playing keyboard parts (because large fingers don’t work well on small keys), and addressing a bug that causes the app to crash after saving custom drum kits (ever since iOS 11!!). I also agree with another reviewer who mentioned that file management (as well as importing and exporting projects to something OTHER THAN MASCHINE, which is something many of us DON’T have) needs to be better and more integrated. It’s sorta “bassackwards” to develop all of these soundpacks (again...44.1 and 16?!!?) and ignore the framework and usability of the app itself. 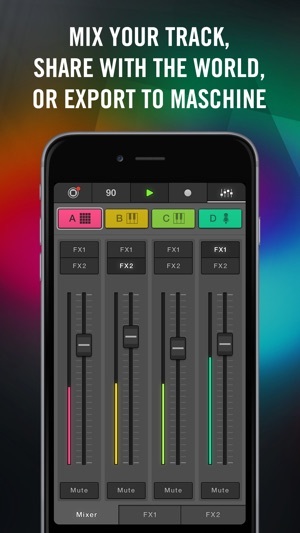 I mean, thanks for the addition of effects and all, but at this rate, NI shoulda added this app among their numerous updates and additions to their arsenal of products across the board. Maybe an iM3 wouldn’t be too much to ask these days...? 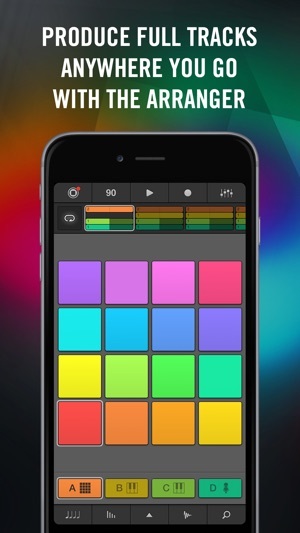 I had been contemplating getting this app for some time because I didn't know how fluid it would be far as making beats on a mobile device but after reading reviews and taking a chance, I was amazed. The interface is smooth and looks great. There's no lag and it quantizes sounds perfectly. You may struggle at first but once you get going. It's hard to stop. What really makes this app great is the ability to export this right into Maschine on your computer and pick up where you left off to do even more. 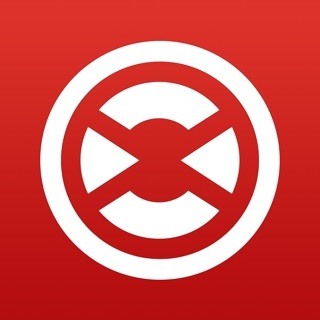 By no means is this app perfect or meant for full production but if you're out and about and got an idea come to mind, look at this as a sketch pad to get those ideas out, transfer them, and go in more once you get home! Also you can get all the expansion packs separately for one price of $9.99. Which is a great deal so you can't beat it! The number one thing needed is cloud support. Actually all of their product would benefit from cloud services that way you would be able to sync all projects cross all your devices and their products instead of needing work arounds when changing devices or want projects for the computer app or vice versa. Also they need to update this for iPad Pro 11” because there are big boards around the app. I don’t think they update this app much because it seems like they aren’t trying to improve the app in general because they know it’s good. But the thing is it could be better with small changes that could drastically change the user experience. If they could fix those complaints this app would be A+ because outside of those complaints it’s really good. It’s a slightly simpler version of desktop version which is a good thing on a mobile device.